One of the governing parties in Germany, the Christian Social Union, has elected a new leader to replace the outgoing veteran, Edmund Stoiber. The CSU, the Bavarian sister party to Chancellor Angela Merkel's Christian Democrats, chose the state economy minister, Erwin Huber, as its new head. He is described as a moderate conservative and pragmatist. 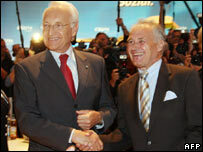 The CSU leader traditionally plays a prominent role on the national political scene in Germany. Mr Huber, who replaces Mr Stoiber, the CSU leader for 14 years, will continue to be influential, as Mrs Merkel's CDU depends on CSU seats in the lower house for power. "The CSU is an independent political force and we will keep it that way in our partnership with the CDU. They must know they need a strong CSU to rule," Mr Huber told party members. Mr Huber, 61, will also lead the predominantly Roman Catholic party, which has ruled Bavaria with an absolute majority for more than 45 years, into a state assembly election next year. Mr Stoiber, who narrowly failed to become German Chancellor in the 2002 election, had been a persistent critic of Mrs Merkel's reform agenda.